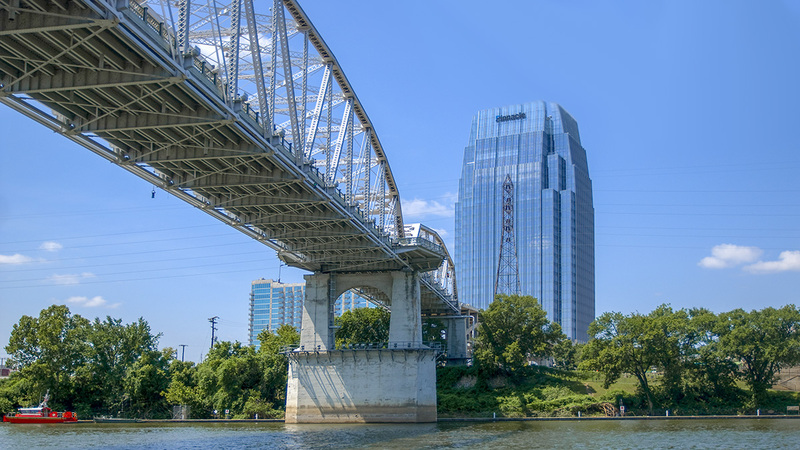 Built in 1909 to connect East Nashville’s suburbs to its downtown, this span across the Cumberland River was known for most of its life as the Shelby Bridge, before being renamed for the late editor of the Tennessean newspaper, a crusader for civil rights, in 2014. 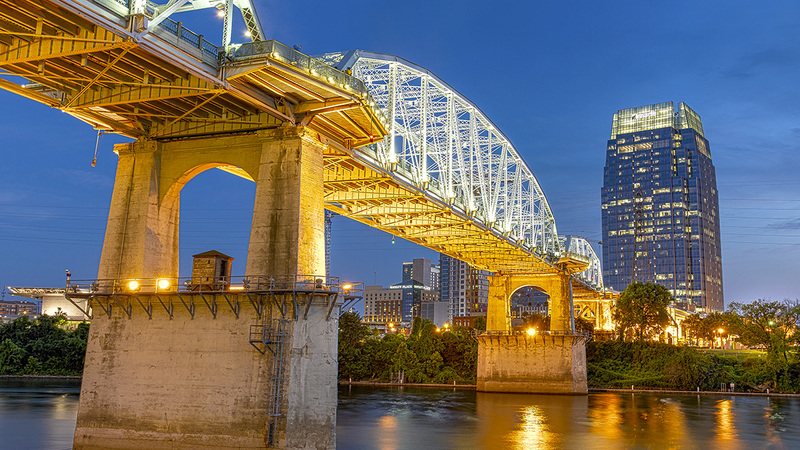 It was designed by Howard M. Jones, the chief engineer of the Nashville, Chattanooga, and St. Louis Railway, and was the first in North America supported by arched concrete piers. 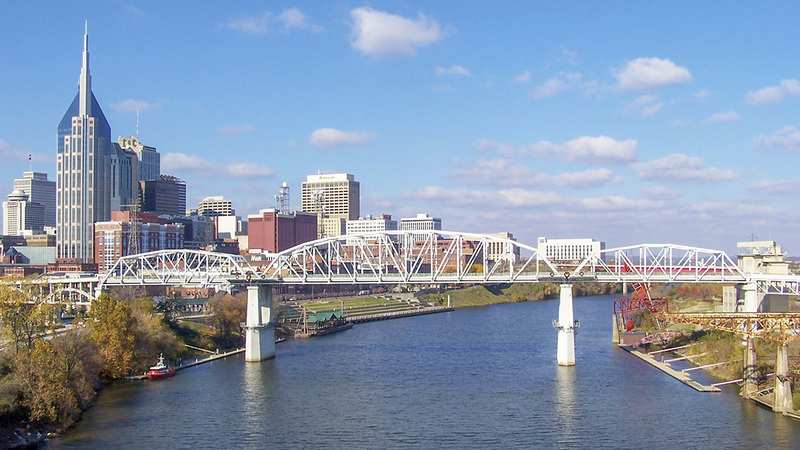 Deemed hazardous and in poor condition, the bridge was officially closed to vehicles in 1998 and scheduled for demolition, but because of its historical and architectural significance it was, in 2003, transformed into a pedestrian-only bridge by the firms Hawkins Partners, Gresham Smith & Partners, Barge Waggoner Sumner and Cannon, and A. G. Lichtenstein. The pedestrian route begins on the west at Third Avenue South, slowly rising above three city blocks before crossing the river. 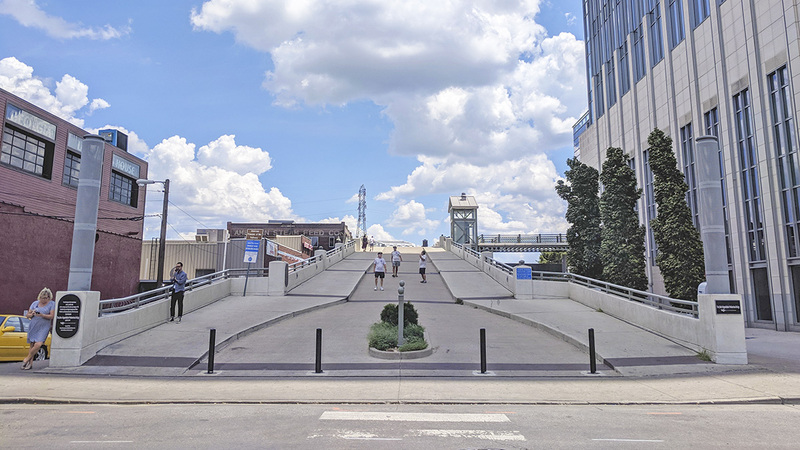 After reaching the west bank, the walkway gradually descends over Cumberland Park, eventually meeting four square platforms (each planted with medium-sized trees) arranged in a stair-step fashion to reach the plaza below. 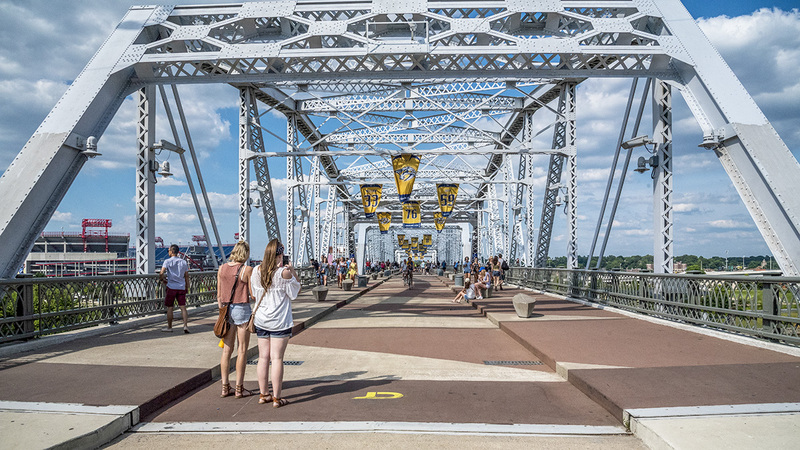 Placed at intervals and marking the approach to the bridge on each side are square brick pavers with white diamond patterns. 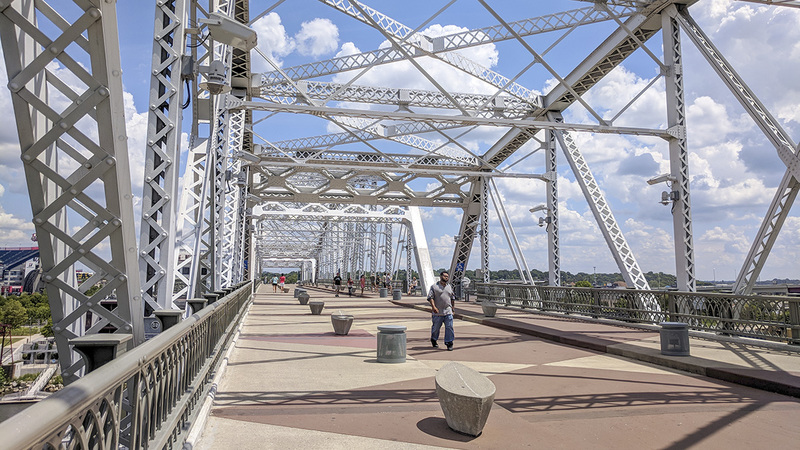 With its steel trusses now painted white, and its concrete surface enlivened by triangular patterns alternating between red and light-colored pavement, the bridge has a fifteen-foot-wide central bike lane that is flanked on either side by ten-foot-wide, elevated sidewalks. 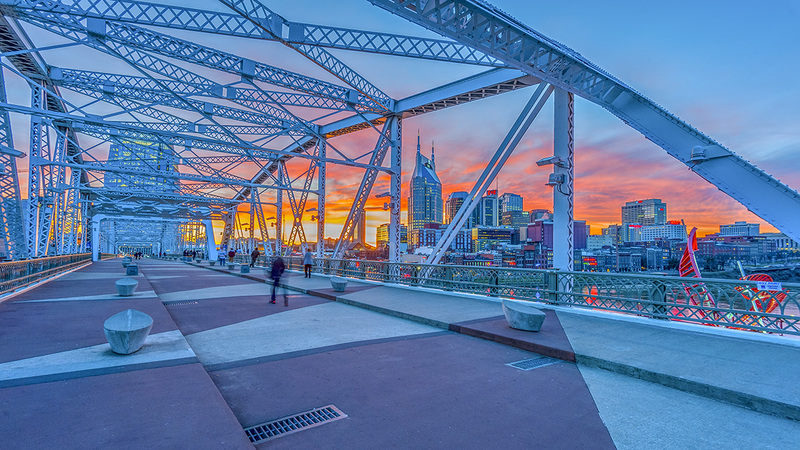 Oval-shaped concrete seats are placed intermittently along the sidewalks, which open to four overlooks (two on each side, directly above the concrete piers) that provide panoramic views of Nashville to the north and south. 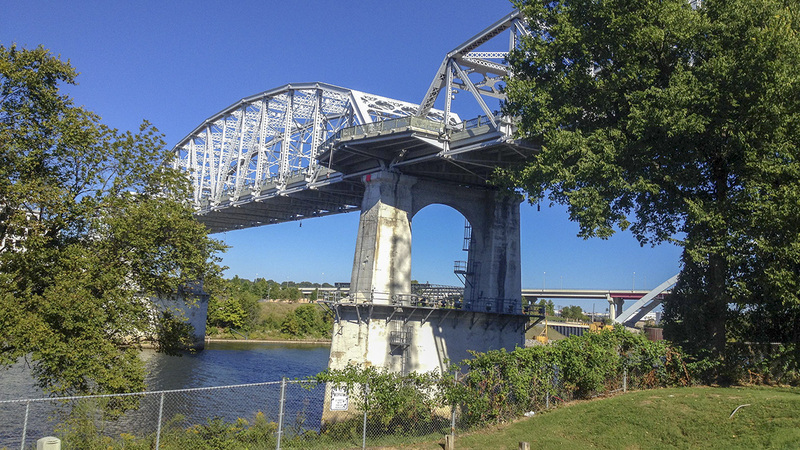 The bridge was listed in the National Register of Historic Places in 1998.